Providing you the best range of designer dining chair, black dining chair, stainless steel dining chair, ct-4 russian chair and fancy dining chair with effective & timely delivery. Being a quality-oriented company, we are engaged in providing a broad array of Designer Dining Chair. Our designers design the range of steel dinning chair as per the latest trends and styles, which is not only pleasing to the eye, but also stands high on quality. Our steel dining chairs are highly appreciated due to their excellent comfort and unique designs. We provide these steel dining chairs in different sizes and specifications for achieving the multifarious demands of the customers. 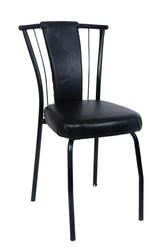 Our organization has gained immense appreciation from our clients for offering premium quality Black Dining Chair. The offered steel dining chairs are widely used for diverse famous hospital canteens, hostel canteens, institute canteens, hotels, restaurants and many more. Offered steel dinning chair is accessible in various designs & sizes as per customer’s necessities. Seamless finish to offer smart & elegance dining experience. With firm commitment to quality, our organization is remarkably offering hugely acknowledged and demanded Stainless Steel Dining Chair. 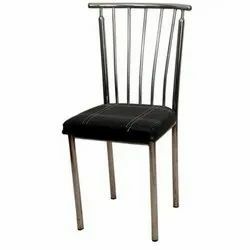 These steel dining chairs are widely used for diverse famous hospital canteens, hotels, restaurants, hostel canteens, institute canteens and many more. These steel dining chairs are made using latest techniques and following modern trends. In addition to this, our steel dining chairs are stringently checked on various parameters such as strength, finishing, resistance against rust and other to ensure its flawlessness. Our company is committed towards offering a high quality range of CT-4 Russian Chair. The offered multi seater chairs are made with using finest quality stainless and modernize technology according to the whole market prevalent norms under the guidance of experts. The multi seater chairs provided by us are examined by quality checkers. Apart from this, we are giving these multi seater chairs in numerous sizes at affordable rates. Backed ourselves with modern machines and skills, we are offering our customers best and most elute quality array of Fancy Dining Chair. These steel dining chairs are beautiful and most amazing to look at. 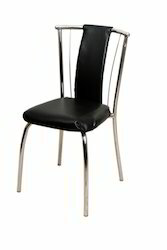 These steel dining chairs are available in many sizes, design and colors that make our customers happy and delighted. These steel dining chairs are beautiful and very stylish to look at. 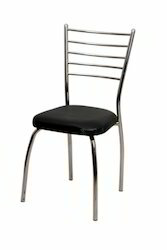 These steel dining chairs are highly appreciated for its stylish design and cost effective rates. 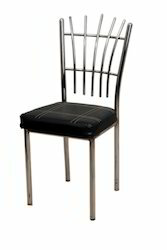 Looking for Metal & Stainless Steel Dining Chair ?